The kneecap, or patella is a common cause of knee pain. Pain in the front of the knee can be caused by many different problems. Chondromalacia or softening of the cartilage is a common cause of pain, particularly in young women. Patella dislocations, and stability of the kneecap is also a relatively common cause of kneecap pain and popping. Lastly, and usually affecting people over 30 is osteoarthritis of the kneecap. In this post we are going to cover the most common causes of kneecap pain and some of the treatments available. Why does my kneecap hurt? The kneecap or patella is an oval bone that “floats” on front of the thigh bone. It is attached to your quadriceps and patella tendons. The bottom of the thigh bone has a groove in it. The kneecap sits in that grove. To enhance stability and prevent the patella from sliding around too much, the patella is V-shaped to fit in the groove properly. The patella has two ligaments on either side which prevent it from dislocating. The medial patellofemoral ligament (MPFL) on the inside and the lateral ligament on the outside. Chondromalacia and arthritis of the patella. Anterior knee pain: Runners knee. Chondromalacia means softening of the cartilage. Cartilage is typically a firm, rubbery substance that serves as a cushion and shock absorber in our knee. The cartilage might soften due to genetic issues, injuries, instability (which we will cover below), and in some arthritic conditions. 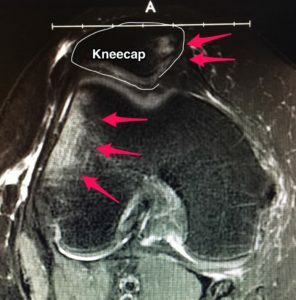 The pictures below shows normal cartilage under the kneecap and cartilage which has started to soften and deteriorate. Notice the fissures and irregularity of the cartilage surface. When the cartilage beneath the patella softens it becomes less resilient. This can cause an increase in stress on the patella with certain activities. Sometimes as the cartilage deteriorates loose flaps or pieces can develop and can cause irritation. Chondromalacia may bother people when they walk stairs, sit for a while or participate in jumping sports and sprinting sports. The pain is usually in the front of the knee under the kneecap. Most patients with mild chondromalacia will notice an improvement in their pain with physical therapy. Believe it or not, the research has shown that therapy directed towards the hips and pelvis is usually successful. Most people with chondromalacia will feel better if they wear a compression sleeve. Some very effective knee sleeves can be found here. Surgery for mild or moderate chondromalacia is usually not necessary. Injections such as PRP or stem cells are also not effective. As mentioned earlier, the patella usually sits in a deep groove on the front of the thigh bone or femur. A dislocated kneecap can occur due to trauma or a sports injury. Instability (or dislocations) of the kneecap can also occur because of how your kneecap and thigh bone formed. Some of you were born with a groove on the thigh bone that is not deep enough. With certain sports injuries, you may be struck in the front of your knee. That can cause the kneecap to dislocate. In these cases, the dislocation usually occurs because the ligament on the inside of your patella tore. That ligament is called the medial patellofemoral ligament (MPFL). Patella dislocations are almost as common as ACL tears in young athletes so this is not a rare injury. Sometimes its difficult to determine if you actually had a dislocated kneecap. After you are struck, the kneecap will usually dislocate, then spontaneously reduce back into its normal position. As seen on the MRI on the right, we will see light areas in the bone after a patella dislocation. Those are areas of inflammation because the two bones struck each other when the kneecap slipped out-of-place. After your first dislocation, you will usually be treated with rest, crutches, a brace and physical therapy. IF you have a second dislocation you may require surgery to reconstruct the MPFL. Another common cause of kneecap pain is patella malalignment. Malalignment of the kneecap can occur due to an imbalance of your soft tissues, or dysplasia of kneecap and femur. Dysplasia causes kneecap malalignment due to improper formation of the groove that holds the patella in place. We call this process dysplasia. Patella subluxation is quite common. If the groove on your thigh bone is not deep enough, it may not hold the patella in place. This allows the kneecap to subluxate or move out of its normal position. Some of you also have a condition called Patella Alta. That means that your kneecap is starting too high and not sitting in the groove until your knee bends. That leaves the kneecap particularly vulnerable to injuries such as a dislocation. Many young patients with pain in the kneecap of the knee due to groove dysplasia might respond to physical therapy, taping and bracing. Persistent pain due to subluxation will often lead to surgery as an option for treatment. The type of surgery necessary depends on whether or not you have dysplasia, patella alta and/or an incompetent medial patellofemoral ligament. 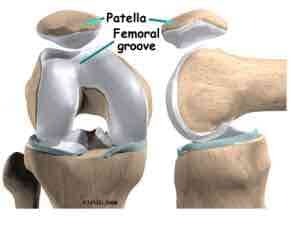 During surgery, we may need to bring your patella lower to correct the patella alta. Many will also have an incompetent or torn MPFL and require an MPFL reconstruction. 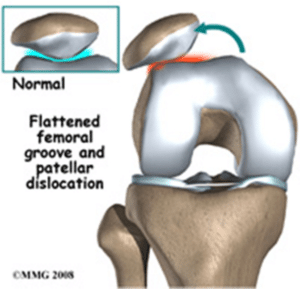 The decision regarding which procedure might best correct your patella malalignment is complex. There are many potential variables involved. We cover surgical options for Patella instability due to dysplasia in this video. Runners commonly have pain in the front of the knee. Most often an MRI will not reveal any structural abnormality of the kneecap. In addition there is often very little swelling. The pain from a runners knee can be brought on by your running technique. A heel strike is known to cause more stress on your knee. In addition, people with a longer stride or low cadence might be susceptible to developing pain in the front of the knee. One commonality seems to be that most people with a runners knees have weakness in certain muscles around the hip and pelvis. Most of the current scientific literature supports physical therapy, focusing on the hips and pelvis as a good treatment option for a runners knee. Some runners find that a compression sleeve is useful in minimising kneecap pain. We cover the runners knee in more depth here. A jumpers knee is a cause of pain in the front of the knee in athletes involved in sprinting and jumping sports. The pain comes from the patella tendon which attaches to the kneecap. This is considered an overuse injury and we covered the treatment of jumpers knee previously in this post. Kneecap pain is a very complex topic. There are many issues that can cause pain in the kneecap. Some of the predisposing factors you are born with, some are due to trauma or injury. Pain in the kneecap requires a very thorough and thoughtful examination before determining the best course of treatment. What are some of the most common causes of knee pain in runners? ← Is Blood Flow Restriction Therapy Useful In Recovery From ACL Surgery? Thanks for this post. My wife is starting to get some popping and clicking in her knee, especially when climbing stairs. It sounds like a compression sleeve might be a good start to mitigate any issues, especially while playing sports. I am 50 yrs old and I was doing heavy leg press when I heard a pop in my right knee. Not too much pain at the time. However, a few days later I had excruciating pain running down from my knee through my shin. I couldn’t push the gas pedal down for a month. MRI results are read as follows. 1.Complex tear of the posterior horn and root of the medial meniscus with a flap tear fragment displaced over the root. 2. Sharply defined 7 x 9mm cartilage defect in the lateral femoral condyle. Thin cartilage fissure in the medial femoral condyle. 3. Large ACL ganglion cyst extending into the femur. & Right&Knee. What are your impressions? Thank you in advance. Root tears Can be very painful for 8-10 weeks… The pain will then usually subside. Check out the post I linked to… the rationale for treating these tears is evolving. I had a PRP done 8 days ago for Moderate Arthritis, due to having my meniscuses partially removed. exercise either, but some. 15- 20 min walking or 10 min exercise bike each of the last 4 days, plus started Yoga simple stretches too. How I would love not to have a TKR. Will this injection stop the progression? I’m glad to hear the injection appears to be working for you. PRP injections can be useful in many cases of arthritis. It can calm down the inflammation and make the knee feel much better. While there is some literature to suggest that PRP injections can diminish the risk of progression …. there is no evidence that PRP will reverse the arthritic changes. 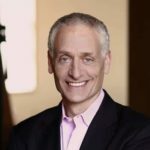 I’m 69 and healthy. Recently I’ve developed pain in my left knee cap when getting down on all fours to play with my dog. The patella feels somewhat malformed on the outside lower left corner, like a spur. The right patella feels smooth and even. It came on suddenly and I’m not sure what to do about it. The only pain is when I get down on my hand and knees. This could be due to a few different issues… I would suggest having an Orthopedist take a look at your and your xrays and see what’s going on.